A journey through the history of Music in Venice will take us to the area of the city where the Venetian celebrated musician Antonio Vivaldi was born. We'll see the Church where he was baptized and the most popular stage for his concerts, the Ospedale Santa Maria della Pietà, a home for foundlings. The Pietà specialized in the musical training of its female wards, and those with musical aptitude were assigned to its excellent choir and orchestra, whose much-praised perfomances assisted . the institution's quest for donations and legacies. 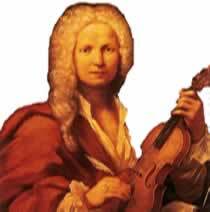 Here Vivaldi was the chorus-master and violin teacher, and composed some of his greatest concerti. The fame of these concerts increased so much that attending la Pieta became very fashionable. The temple of Music in Venice is of course the Fenice Opera House. The name given to the theatre was probably fatal to it: since it was built in 1792, it was gutted by the fire twice. Once in the 19th C, and once more few years ago, in 1996. After long investigations, which proved how this last fire was set off intentionally, the opera house was eventually rebuilt as a perfect replica of the lost one, and our visit will make us retracing the ups and downs of this historical sanctuary of the “bel canto”, while breathing the atmosphere of a stage that saw the passionate performances of opera stars like Maria Callas.